Bunjurgen Estate is a 60-acre property situated 10 km south of the township of Boonah. Welcome to Bunjurgen Estate Vineyard! We are located 10 kilometres and 10 minutes South of Boonah on a rise in the Teviot Valley on the way to Mount Alford, in the beautiful Heart of the Scenic Rim, in South East Queensland, Australia. We are an easy thirty minutes’ drive from Ipswich and RAAF Amberley; a one hour drive from Brisbane, or a one and a half hour drive from the Gold Coast. Our Chambourcin and Shiraz vines produce our legendary Rose styles: our sensational and highly regarded Shiraz Verjuice, still and sparkling: our medium dry red wines; and our acclaimed White, Cherry and Tawny Ports. 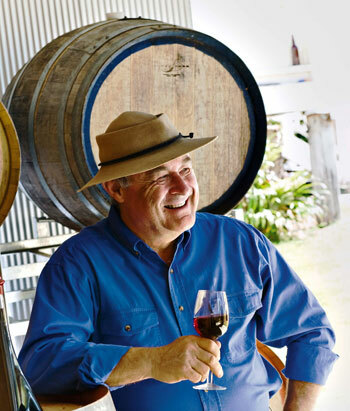 Do not fail to ask for a taste of our Famous Bunyip Tawny Port – a local icon of the Scenic Rim food and wine scene during Eat Local Week annually. Our easy drinking wines and ports, and Verjuice too, are available in our outdoor tasting area with picturesque views of the Scenic Rim mountains. Cellar Door open 10am - 5pm Wed - Sun & Public Holidays. - and the French Bread and the Olive Oil and the pumpkins and the wine, we will be back. My sincere congratulations on the results of your venture into competitive wine making. A Silver medal is a great start, must have been the care, attention and soft handling of the fruit!!! Well done my friend. Thank you for a wonderful day and the very pleasant manner which you showed to our children. We all loved the Big Dog and Koda too. Take care and look after yourself.